[Subjectivities]: Call for submissions for a new Southeast Asian Studies undergraduate biannual research journal. Subjectivities is a new biannual research journal run by students from the NUS Southeast Asian Studies Society. Each issue tackles a specific theme concerning the region. We would like to invite students, faculty members, as well as external individuals to contribute their works on Southeast Asia. 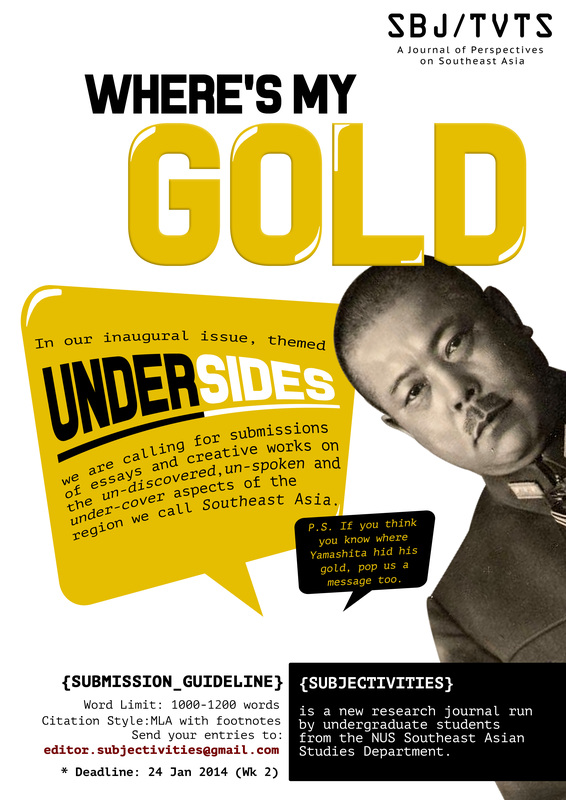 In our inaugural issue, themed UNDERSIDES, we are currently calling for submissions of essays and creative works (eg. artworks, poems) on the un-discovered, un-spoken and under-cover aspects of the region we call Southeast Asia. Send in your entries to editor.subjectivities@gmail.com. You may contact editor.subjectivities@gmail.com for more information about the submissions. We hope you will be keen to contribute and share your interest in this region with us and we look forward to reading your works.